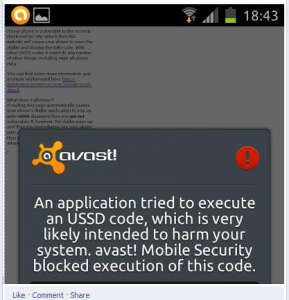 Last week we told you in the avast! blog about the nasty attack against Android smartphones which could lock the SIM cards or completely wipe all of the data and reset to factory settings. We are pleased to confirm that the newest update of avast! Free Mobile Security protects against USSD attacks, without having to install additional tools. "The benefit of our solution is that we do not require the user to install an additional tool, as the newest update of avast! Mobile Security already contains the protection," said Reinhold Holzner, Managing Director of AVAST Software Austria. "All you need to do is to accept the program update on your smartphone." Avast! Free Mobile Security is a full-featured anti-theft and anti-malware app for Android smartphones and devices. With special “stealth” and remote-access features, including lock, wipe and siren, as well as an abundance of remote text commands, smartphone users are protected against the loss or misuse of their device. Avast! Free Mobile Security is completely free and available through Google play. Protect your devices now, and please tell a friend about it too.